Operates Prairie Smoke & Spice, with the largest fleet of mobile commercial smokers in Canada – serving up to 5000 people per day at some of the largest public events in the country. Kris Valckx is the head cook & pitmaster of the Calgary-based BBQ team, Rocky Mountain Smokers. Kris has been competing competitively for the last 5 years winning awards and accolades everywhere he competes! He is one of the most successful and well-respected BBQ cooks in Canada. He is the 2016 KCBS International Team of the Year for Pork and has competed in every province from BC to Quebec. Kris is also the Alberta Chapter Lead for the Canadian BBQ Society, and a member of the BBQ on the Bow Society, actively promoting BBQ in Calgary and the nation! Kris’s classes can be found HERE. John Thomson wears a few hats in the world of Canadian BBQ and usually smells of smoke. BBQ Sauce runs in his veins and it seems that every spare moment he has is dedicated to his favourite hobby. With a full time job in IT and a young family of 3 kids, those spare moments are hard to come by, but as with most hobbies, it is a labour of love. Once the BBQ Competition season ends in late October, John immediately shifts into the role of Organizer for the largest BBQ Competition in Canada, the Capital BBQ Festival, in Ottawa, Ontario. John is also a Regional Chair of the Canadian BBQ Society and a BBQ Instructor. But it is competition BBQ that really drives him and keeps him on the road a fair amount. 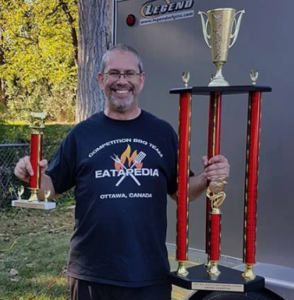 2017 was his 7th year as Pitmaster of Ottawa, Ontario’s Team Eatapedia, and it was a banner year for John. Finishing 1st Place in the Canadian Team of the Year Points Race, Team Eatapedia is the 2017 Canadian National BBQ Champion, as well as the Ontario Provincial Champion, KCBS’s International Team of the Year Overall and 1st Place KCBS International Ribs. 3 GCs, 2 RGCs and 40 Top Ten Calls and 7 1st Place calls. With a long history of teaching and working with BBQ people of all walks of life, John’s classes are typically very interactive and engaging. With years of experience, starting as an Amateur Competitor, John hosts a relaxed atmosphere of conversation about BBQ while sharing experiences, guidance, tips and award winning BBQ food. You will learn, and you’re going to enjoy it.